Tai Tuivasa, who fights Andrei Arlovski this Saturday on the main card of UFC 225, doesn’t hesitate when asked if he would rather lose an entertaining fight or win a boring fight. “Yeah, I’d rather lose an entertaining fight, for sure. I don’t like boring fights”. In a fighter of less ability, that attitude might be a recipe for a losing record. In the case of the UFC heavyweight dubbed “Bam Bam,” it’s translated into a record of 9-0, with each victory coming by way of knockout. Come Saturday at Chicago’s United Center, Tuivasa will put that ethos to the test once again against his most dangerous opponent yet. 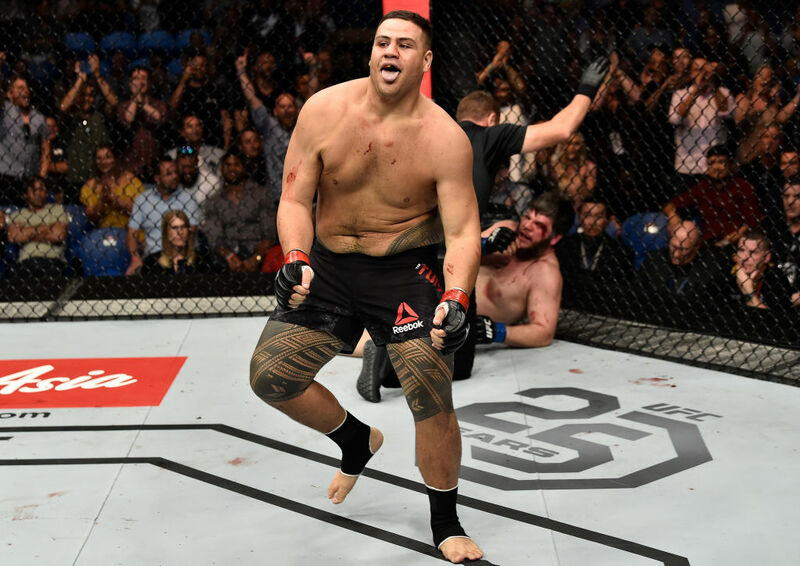 Tuivasa has earned the step up in competition after scoring a brutal TKO over France’s Cyril Asker in February at UFC 221. Asker was never in the fight as Tuivasa pressed forward and rocked his opponent with huge punches and elbows. Somehow, Asker remained on his feet until the 2:18 mark, when he finally slumped to the ground. After five straight losses in 2016 and 2017, former UFC heavyweight champion Arlovski has finally regained some momentum. “The Pit Bull” has most recently scored decision wins over Junior Albini and Stefan Struve, clawing his way back to a number nine ranking. On February 5, 2005, Arlovski became the most feared man in the UFC’s heavyweight division. The Belarusian felled Tim Sylvia with a right hand before pouncing on an achilles lock to become the UFC interim heavyweight champion at just 49 seconds into the first round. Tuivasa, a product of Western Sydney, was just 11 years old at the time. But he never looked up to Andrei Arlovski. Or anyone else on the UFC roster, for that matter. The 25-year-old “Bam Bam” admits that he likes being the one fighting, but isn’t a fan of watching others fight. So don’t count on the No. 12-ranked Tuivasa being starstruck against the 39-year-old Arlovski. “Bam Bam” has seen a few of Arlovski’s fights now, but leaves the strategizing to his team, which includes head coach Steve Ashby. Tuivasa just shows up and does the work. Tuivasa may not be a student of the game in the usual sense, but if his increasingly slim physique is an accurate indicator, the hard work is there. An unanswered question about Tuivasa is his skill level in grappling. Tuivasa believes he’s getting better on the ground. He admits, however, that he’s far happier when he’s on his feet trading bombs. When asked whether he’s pulling off submissions in training, he responds in typical Tuivasa style. With Tuivasa, it can be difficult to distinguish between truth and comedic understatement. The truth about how far his submission game has come will no doubt surface in the UFC’s Octagon. If there was a fight to put Tuivasa’s ground skills to the test, it probably won’t be this Saturday’s against Arlovski. Tuivasa enters as the favorite in what is expected to be a slugfest. Part of those odds probably reflect the conventional wisdom that Arlovski, while a dangerous offensive fighter, has been knocked out in three of his previous five losses. The deceptively graceful and heavy-handed Tuivasa therefore seems a dangerous match for the former champ. Tuivasa is aware of that school of thought on Arlovski, but the fighter of Aboriginal and Samoan descent acknowledges that he’ll have his own share of risk come Saturday. It’s the biggest fight of Tuivasa’s career, in the archetypal matchup of former champion vs. rising contender.